A Genuine Humanitarian: But, David Shearer’s back-story has a back-story of its own: an unusual and counter-intuitive fascination with armed force that raises many more questions than it answers. IT’S SURPRISING how little we know about David Shearer. For most of us, his sudden appearance among the contenders for Helen Clark’s vacated seat of Mt Albert was the first appearance he’d made upon the New Zealand political stage. For Mr Shearer, however, the 2009 Mt Albert By-Election was a case of third-time-lucky. He had already stood for the Labour Party twice before: the first time, in 1999, as a lowly ranked candidate on the Party List; and the second, in 2002, in the safe National seat of Whangarei. Our ignorance of those earlier attempts is forgivable, however, because Mr Shearer has always been a political paratrooper. In contrast to the party foot soldiers who slog their way through the Big Muddy of branch meetings, canvassing exercises, billboard construction and pamphlet deliveries, rising through the ranks to fight the good fight on policy committees or the NZ Council, Mr Shearer’s preference has been to jump into parliamentary candidacies from a great height and out of a clear sky. The reason for this top-down method of delivery is Mr Shearer’s remarkable back-story. It’s not many thirty-five year-olds who are named New Zealander of the Year, and even fewer are awarded an MBE by the British Government. Mr Shearer’s experiences delivering aid on behalf of the Save the Children Fund in war-torn Somalia were genuinely heroic. Here, as far as the rest of the world was concerned, was a genuine humanitarian. But, Mr Shearer’s back-story has a back-story of its own: an unusual and counter-intuitive fascination with armed force that raises many more questions than it answers. This focus on Mr Shearer’s and Mr Key’s “overseas” experiences has led many to assume that both men were out of the country during the pivotal years 1984-1993. In Mr Shearer’s case, however, this is untrue. For nearly the whole period of the Fourth Labour Government (1984-1990) he was here, in New Zealand, studying, teaching and consulting. If he was a Labour Party member at any time during those tumultuous years, then he was a very quiet one. He certainly wasn’t among the ranks of those who fought against Rogernomics. He has, however, often spoken to journalists about his admiration for David Lange’s speeches. This inability to get worked up about the core elements of neoliberal “reform”: labour market flexibility; privatisation; deregulation; monetary and fiscal discipline; explains his rather odd belief (for a Labour leader) that the contest between Left and Right is “a phony debate”. Such ideological agnosticism – explained away as good old Kiwi pragmatism – does, however, offer us a way into the most unusual and contradictory aspect of Mr Shearer’s entire career: his support for mercenary armies, or, as they prefer to be known these days: private military and security companies (PMSCs). It is possible to trace this thread all the way back to Somalia in 1992 where Mr Shearer headed up the relief effort of the Save the Children Fund. It is more than likely he enjoyed a close working relationship with the United Nations Mission in Somalia and would, therefore, have been aware of their appeal to the PMSC, Defence Systems Ltd (DSL) for 7,000 Ghurkha mercenaries to protect their relief convoys. In the end DSL turned them down, but it is clear that the notion of PMSC involvement in UN protection work (as opposed to soldiers provided by UN member states) made a deep impression on Mr Shearer. That impression was intensified by Mr Shearer’s experiences three years later as the UN’s Senior Humanitarian Advisor in the West African nation of Liberia. 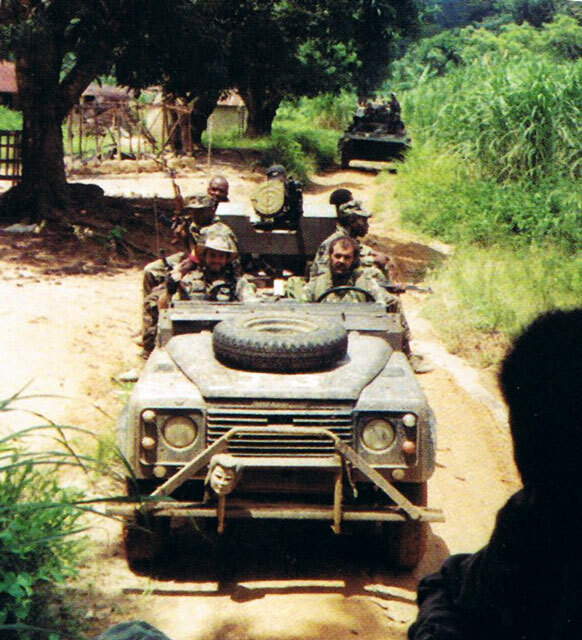 Just across Liberia’s northern border, in the ravaged state of Sierra Leone, the PMSC known as Executive Outcomes had been employed under contract to the Sierra Leone Government. Shearer was deeply impressed by this mercenary army’s lightning-fast defeat of the Liberian-backed forces assailing the ruling regime. Fast and Furious: In 1995 the PMSC, Executive Outcomes, proved spectacularly successful in restoring order to war-ravaged Sierra Leone. A year later, in 1996, Mr Shearer was advising the UN in Rwanda. It was here, just two years earlier, that a brutal genocide had taken place while the United Nations watched – and did nothing. Trying to stitch the rudiments of civil society back together after a disaster on that scale cannot have been easy. This was followed by what might be called the John Le Carré phase of Mr Shearer’s career; his two-year stint (1996-1998) as a research associate at the International Institute of Strategic Studies (IISS) in London. Like its sister institute – The Royal Institute of International Affairs, also known as Chatham House – the IISS has always laboured under strong suspicions of being a sort of “front organisation” for Britain’s foreign affairs, defence and intelligence “community”. This was most clearly illustrated in 2003 when the IISS released a report strongly favouring the UK’s participation in a US-led invasion of Iraq. Like the infamous “sexed-up” report released by the Security Intelligence Service (MI6) just two weeks later, the IISS also warned against Saddam Hussein’s (non-existent) “weapons of mass destruction”. Since 2003 the IISS’s Director of Transnational Threats and Political Risk has been Nigel Inkster – formerly the Deputy Director of MI6. It was into this looking-glass world of spooks and former-spooks that Mr Shearer settled himself. His research bore spectacular fruit in 1998 when his article “Outsourcing War” was chosen as the cover-story for the Fall Edition of the prestigious American journal Foreign Affairs. Extremely well-written, the article is a paean of praise for outfits like Executive Outcomes and DSL. A very similar article, “Private Armies & Military Intervention”, was published that same years as Vol. 316 of the IISS’s Adelphi Papers. Mr Shearer’s time at the IISS certainly did not hinder his career prospects in the United Nations. In 1999 he left London’s clubby world of foreign affairs, defence and intelligence cogitation for the considerably less congenial territory of the Balkans. With the Kosovo Crisis in full cry he helped coordinate UN aid in Albania, ultimately winding up in Belgrade as Chief of the United Nations Office for the Coordination of Humanitarian Affairs (OCHA). It’s probably as well to remind ourselves at this point of the dark history of PMSCs in the former Yugoslavia. The relationship between the UN and the private enterprises now responsible for everything from basic logistical services to security personnel was plagued by scandal. Whistle-blowers and journalists together exposed the links between the UN’s private contractors and organised crime. Most progressives would have recoiled from the revelations, but Mr Shearer’s support for the private sector’s increasing participation in UN operations persisted – especially when it took the form of PMSCs. By 2000 Mr Shearer was back in New Zealand and working in the office of fellow Papatoetoe High School old-boy, Phil Goff – now Minister of Foreign Affairs and Trade in the newly-elected Labour-Alliance Government. It was presumably with the latter’s blessing that, in 2001, Mr Shearer penned yet another article – this time for the Chatham House (remember them?) newspaper The World Today entitled “Privatising Protection”. Future troops being offered to peacekeeping forces might well come from private companies rather than states. The US firm Dyncorp, for example, provided the US share of the Organization for Security and Co-operation in Europe monitors in Kosovo. Dyncorp is now training Colombian soldiers in its drug war. Another company, MPRI, also recently in Colombia, continues to train the Bosnia army in sophisticated US weaponry. By 2003 Mr Shearer was back with the UN, this time in the Middle East. As the Head of OCHA in Jerusalem and then as the UN’s Humanitarian Relief Coordinator during the Israeli assault on Southern Lebanon and Beirut, he distinguished himself as a fiercely independent upholder of the UN’s mission. Few were surprised, therefore, when, in 2007, after four years of negotiating his way through the labyrinth of Israeli-Palestinian relations, the UN Secretary-General, Ban Ky Moon, named David Shearer as his Deputy-Special Representative in Iraq. He was also appointed Head of the UN Development Project Iraq. Holding these two very senior roles in the United Nations Mission in Iraq (UNAMI) Mr Shearer was almost certainly “in the room” when decisions about the use of PMSCs were being made. The numbers for UNAMI are particularly interesting. In 2007 UNAMI spent zero dollars on PMSCs. In 2009, when its former 2IC was back in New Zealand campaigning for Helen Clark’s old seat of Mt Albert, UNAMI also spent zero dollars. In 2008, however, the amount spent by UNAMI on PMSC’s was US$1,139,745. It is important to place this expenditure in context. It was in September of 2007 that the US-based PMSC, Blackwater Worldwide, found itself at the centre of war-crimes accusations following the unlawful killing of 17 Iraqi citizens in Baghdad’s Nasour Square by one of the company’s notorious “Personal Security Details”. 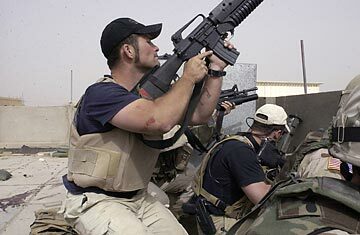 The outraged Iraqi government had responded by revoking Blackwater’s licence to operate within its borders. It is fair to say that foreign mercenaries were not popular in Iraq in 2008. Private Solutions? The US-based PMSC, Blackwater Worldwide, earned a fearsome reputation during the Occupation of Iraq. And so we return to Mr Shearer’s preference for private military solutions to low intensity conflicts and his conviction that the United Nations is better able to carry out its humanitarian functions in something resembling safety with private sector support. There is a serious question here: if a private force, operating with international authority and within international law, can protect civilians, how moral is it to deny people protection just because states can’t or won’t find the forces to do it? Or put another way, is the means of response more important than the end for which it is used – particularly where a failure to respond results in the death and abuse of civilians? Mr Shearer’s position has been explained away as just another case of a good Kiwi bloke, impatient to get the job done, and not being particularly fussed about how things are made to happen – or by whom. And if the universal experience of mercenary involvement in “peace-making” was as positive as Executive Outcome’s foray into Sierra Leone, the argument might have some force. In reality, however, Executive Outcome’s success in Sierra Leone stands out as a very lonely exception to a much darker rule. The actual, on-the-ground, operational conduct of PMSCs over the past decade has demonstrated to the world just how dangerous it is to entrust the delivery of deadly force to individuals and corporations whose primary motivation is profit. Yet even in the face of the PMSCs’ appalling conduct in the Balkans and Iraq, Mr Shearer remains sympathetic towards private armies and mercenaries. The Labour Leader’s on-going support for these private-sector problem-solvers speaks volumes – and very little is to his credit. Excellent article Chris, such a pitty this did not appear prior to Shearer gaining nomination. It speaks volumes of the Labour parties selection process and their lack of commitment to their principles. Have a great New Year. given Shearers very close relationship and sympathies with Hamas during his time in Gaza working for the UN, I am sure that the Israeli intelligence "Shearer file" would make intereting reading. I'm not sure he was in Gaza, Anonymous@1:41PM. From what I've been told he was mostly concerned with delineating the true boundary separating the State of Israel from the Occupied West Bank. You are, however, correct in hinting that Mr Shearer and the Israelis were not on the best of terms. And so it would, indeed, be extremely interesting to take a peek at his Mossad file. And not just Mossad: a man with Mr Shearer's connections and experiences would, I believe, be of interest to any number of countries' security and intelligence services. Fascinating article!. This really does explain some of DS behaviour and tendancies. On the positive side it does show that he operated at a higher level than what his atrocious 2012 year of mistakes would have suggested. On the negative it shows that he does not have breadth of experience that is required to lead the Labour party and why he is so dependant on a group of advisors. Given Shearer's experience and leanings he is clearly not suitable for Labour leader as far as I am concerned. The Siera Leone experience seemed to lead him down a path that he could not find an alternative to. It sounds like he became the PMSC's main cheerleader, very interesting given the history of PMSC's. Thus the question is not who is Shearer backing but rather who is backing Shearer? Shearer had a very close relationship and sympathies with Hamas during his time in Gaza working for the UN and the UN operation which Shearer supervised was responsible for hiring many Hamas military wing operatives. In a published report, former UNRWA general-counsel James G. Lindsay stated, "UNRWA has taken very few steps to detect and eliminate terrorists from the ranks of its staff or its beneficiaries, and no steps at all to prevent members of terrorist organizations such as Hamas from joining its staff. UNRWA has no pre-employment security checks and does not monitor off-time behaviour to ensure compliance with the organization's anti-terrorist rules. No justification exists for millions of dollars in humanitarian aid going to those who can afford to pay for UNRWA services." However, I agree with Paul, it sounds like a successful foreign career has not translated to success in NZ. Which to me, speaks more to his potential as a representative in our government. PMSC's sound like a case of high stakes - if done right, excellent, if screwed up, disastrous. I don't think denying his association with them, his belief in their capabilities, or support of their their (few apparent) past successes is really helpful. Just typical politicking now that they're out of favor. After all, state run military's aren't squeaky clean. That is, indeed, the question - and one I'm preparing to post on very shortly. I stand corrected. And, thank you, the information you have provided is very interesting. That's the really odd thing about all this. The articles are masterful pieces of argumentative prose: well-researched and strikingly presented. In other words, nothing like the David Shearer we know. I asked David to explain why he supported private security forces when the issue came up in the Mt Albert by-election. He told me that in one of conflict zones he was in (I can't recall what one) the government forces had a practice of taking a big chopping block around villages and using a machete to hack off the limbs of young mothers. When external intervention, even though it had been sanctioned by the UN, was not forthcoming as a result of inaction by member states, David said he supported the deployment of a private army because, "have you even seen how hard it is for a mother to raise three children with no hands or feet?". There is no "British Government" awarding MBE's. On the British Isles there are governments of the United Kingdom, Scotland, Northern Ireland, the Republic of Ireland, Wales and (I think) the Isle of Man. I don't think the administrations of the Channel Islands constitute governments. But there is no "British Government". There was once a British Empire, but this now consists only of those declared to be its members. The conduct of the rebel forces in Sierra Leone was atrocious - no disputing that. And the impact of Executive Outcomes (with behind-the-scenes support from the British Government) was impressive. All this is acknowledged in the article. The problem Mr Shearer has is that the success of Executive Outcomes stands (as I also state in the article) as the exception to a very dark rule. By the time of the Mt Albert By-Election it was very plain all around the world that the intrusion of profit-making enterprises into the application of military force was an unmitigated disaster. When questioned, why didn't Mr Shearer say as much. Why didn't he simply say that his support for PMSCs was based on his observations of the salutary effect of mercenary intervention in Sierra Leone, but that his subsequent experience in the Balkans and the Middle East had caused him to abandon his support for private armies? Could it be, Conor, because the year before he stood for Parliament in NZ he had sanctioned spending more than $1 million on PMSCs as a senior official of the United Nations Mission in Iraq? It's interesting that Shearer was so influenced by the (alas) wholly atypical success of 'humanitarian intervention' in Sierra Leone in the 1990s. Tony Blair also seemed over-duly impressed by the presumed repeatability of Britain's successful and more direct military intervention in Sierra Leone a few years later. With his ego fuelled by this and the understandable acclaim of the Kosovars, the little man started to think of himself as a war leader. Let us hope that Shearer is not prey to comparable fantasies. Such men are dangerous. As far as I can tell you don't like Shearer because he made the comment about a man painting the roof while on ACC and at the Hornby Working Mens Club he made the outrageous suggesting that migrants shouldn't be taking Kiwi jobs (I didn't follow the Rambo stuff above as I didn't see it as particularily relevant to my position as a member of the working class in NZ). The Savings working group has put the blame for high house prices fairly and squarely on successive governments,blaming tax breaks for property investors and high immigration (a process your friend, David Cunliffe had a lot to do with). Maybe you could start the Ivory Towered Academic Party Chris? Anon @10.50am, The Isle of Man, Channel Islands and the Isle of Wight are all part of the old Duchy of Normandy. The Queen is the Duchess of Normandy. They are part of Britain but not the UK. Self-governing! As for Mr. Shearer, I am not sure he is what Labour needs. Labour really needs to get back to it's grassroots again and break away from the Financiers and Bankers. Mr. Shearer won't! Cunliffe is another rightwing Socialist too. Can't they find a decent leader? Some-one who cares about his/her fellow Kiwis not the private madness that has plagued both major parties. Thanks for enticing me to new depths of pedantry. I will try to give it up in the New Year. No promises, though! Neither the Isle of Man nor the the Isle of Wight were ever part of the Duchy of Normandy. The Isle of Man was long disputed between the then separate kingdoms of England and Scotland, but came firmly under the the feudal lordship of the English Crown in 1399. However, the island never became part of the United Kingdom of Great Britain, retaining its status as an internally self-governing Crown dependency. The Isle of Wight, by contrast, was incorporated into the Kingdom of Wessex in the late seventh century and, along with the rest of Wessex, became part of the Kingdom of England that emerged over the next three centuries, under King Alfred and his heirs. It's been firmly part of England ever since and , hence, of the United Kingdom ever since the latter's inception. The Channel Islands are certainly part of the Duchy of Normandy and, for that reason, are part neither of the United Kingdom nor of Britain. Britain is a geographical expression denoting the island that comprises England, Scotland, and Wales. My wife would insist on adding Cornwall to this litany. The United Kingdom of Great Britain was the name given to the political unit that emerged from the union of the English and Scots parliaments in 1707. The United Kingdom of Great Britain and Ireland was created in 1801 by the abolition of the Irish parliament. The United Kingdom of Great Britain and Northern Ireland came into being in 1922, following the creation of the Irish Free State. In summary, one of the territories you mention (the Isle of Wight)is part of the United Kingdom but not geographically part of the island of Britain. The other two territories are part neither of Britain nor of the United Kingdom. But only the Channel Islands form part of the Duchy of Normandy. An interesting question for us pedants is whether Queen Elizabeth holds the Channel Islands in fealty to the French Republic, as the legal successor to the French Monarchy, which originally granted Normandy to her Viking forebears. By the way, Channel Islands lawyers need to study Roman and French Medieval law at a French university before being allowed to practice. Meanwhile, to complicate matters, the host team at this year's Olympics competed under the name of Team GB. This, despite the presence on the team of some high profile athletes from Northern Ireland. Maybe us pedants count for less than we used to. The point I was making was the the Isle of Man is part of the old Duchy of Normandy. The Channel islands are all that is left of the Old Duchy. They are regarded as being part of Great britain not the UK (England, Scotland Wales and Nth ireland). They are all self governing. I have spent much time in all of those island dependancies, especially Jersey and I loved the time I spent in the Isle of Man. No speed limits on the open roads but 30mph through the towns. The Isle of Man was annexed by Willy I (Conqueror) in 1068AD and incorporated into his Kingdom. The Manx have always regarded themselves as independent of the UK but associated with it. I still am of the opinion that David Shearer is of no use to Labour as he is a Private Enterprise accolite. I'd rather be pedantic than just plain wrong! Unlike the Channel Islands, the Isle of Man is not part of the Duchy of Normandy. How could it be? It's nowhere near Normandy! Nor is it part of England, nor of Scotland, nor of Great Britain (i.e. England plus Wales plus Scotland) nor of the United Kingdom (i.e. England plus Wales plus Scotland plus Northern Ireland). Nor is it formally part of the European Union. It is a dependency of the British Crown. It's just muddled thinking to assume that not being a part of the UK, GB or the EU automatically makes a territory part of the Duchy of Normandy. If that was so, New Zealand would also be part of the Duchy, as would the US, the PRC and most other places. However, I share your view on the total inadequacy of David Shearer as Labour leader, less though because of his lack of left wing principles than because of his lack of the appropriate skills and talents. May I add, however, that I'm surprised to learn that so stalwart a left winger as yourself so enjoyed life on the free-wheeling tax havens of the Channel islands and the Isle of Man. Trite is the only word that fits most of those "assumptions" drawn in this "article"... at beast.. This actually looks more like no more than a blatant attempt to undermine the labour leader with innuendo... Any fair minded individual, with a brain would prefer to know the "facts" rather than be content to filter their assumptions through what is a rather obvious self serving agenda..
Where were your assumptions as to what impressed johnny so much during his time as an international banking pirate? Have you actually asked david for his thoughts on the periods you quote? from what is written here, obviously not..which makes this nothing more than a nasty little dog whistle to the reactionary rabble..
Amongst all that abuse, bb, I couldn't find a single instance of credible refutation. The article cites the Leader of the Opposition's own articles and quotes from them extensively. The facts have not been disputed - merely ignored. Mr Shearer has questions to answer. It is interesting that - to date - he has not attempted to address the very real concerns of Labour members and supporters. He could do this very easily by repudiating his earlier support for PMSCs. That he chooses not to do so is, I believe, significant. You might find a Labour leader who supports private armies acceptable - most Labour people do not. Thanks for the Shearer article, great stuff. Like Key, Shearer has obviously been groomed as an establishment lackie. Does it really make any difference which "party" is in power, when it is the banksters who dictate strategy? Hmmm, potentially dodgy views about PMSSC held by DS. But, sometimes the situation in some of these countries is so horrible, so evil and despairing that ways of restoring some semblance of peace that do not seem acceptable to Westerners living in Western countries are acceptable to others working on the ground, including David Shearer. I'm a policy wonk for the UN, working in Africa for the past 18 years and I've seen UN colleagues working in conflict zones deeply distressed by the inability of the UN to stop violence against innocents. E.g.To stop women being raped in Eastern Congo so badly their internal organs are so damaged they'll be incontinent for the rest of their lives. So, if I was given the choice of 1) Standing by letting the situation worsen or 2) Using PMSCs to stop it, I'd use PMSCs working under strict rules with UN military liaison staff accompanying them. It would be preferable for the international community to approve a standing UN military force, as was proposed but rejected by countries that established the UN. I'm afraid the article, as well written as it is, is largely a hatchet job that relies too much on implied sympathies/actions and innuendo. I am a Kiwi living in London, and working a great deal in Somalia/Somaliland/Puntland, so while I am not as involved with David Sherer's NZ exploits of late, I do know something of the Somali situation. The plain reality is that it is impossible not to know a significant number of private security people. In Shearer's STC role in Somalia, he would have had little choice but to make the best decisions he could about security at the time, and given the resources available to him. And of course he would have needed to maintain good relations with UNOSOM, UNITAF etc. And frankly his suggestion in The World Today that "future troops ... might well come from private companies rather than states" is a perfectly reasonable statement that has been borne out in practice. I am encouraged that Shearer does pose the moral question in the same article. And I'm afraid that I have to agree with the tenor of the argument: while I too am no fan of excessive private sector involvement in a number of areas, including security, I believe it would be irresponsible in the extreme for anyone in a situation such as the many Shearer has been in to ignore the options available. Life rarely offers the neat moral frameworks that are the stuff of polemical blogs. And by the way, I also work closely with Chatham House. Sure, they are reliant on corporate sponsors to an uncomfortable degree. But it means they are not so dependent on state funds as they might be, so are actually more distant from the UK government as a result. And they do a pretty good job on the whole. I have never experienced any pressure to say anything I was uncomfortable with when I've written papers or given talks there, and I don't see evidence that other authors or speakers have been influenced in any other way. So if we strip this essay back to the facts, what are they? Maybe it's true that Shearer was more effective in his humanitarian days than he is as Labour leader. I'll leave that to you all to debate. But there's nothing in this blog that substantiates any claim that his humanitarian days are marked by any big, dark 'back-stories'. a valid question is "if Shearer was Prime Minister and the people of New Zealand demonstrated a dislike for this action ,would Shearer adjust his actions to the will of the people ? "He jumped up, violently jumped up, and dashed out the door," says Mark McNeill, a friend who was with Labour leader David Shearer when Shearer was told his wife Anuschka Meyer was being held at gunpoint. In many ways, it was a typical day for Shearer in war-torn Mogadishu, Somalia in 1992. "A local guide with an AK-47 took Anuschka hostage, and then turned the gun on Dave," explains McNeill, who was there shooting his documentary Mogadishu Madness. "